If you are exercising to not only have a beautiful figure overall but also a beautiful behind, this exercise is for you. The good news is that you do not have to go to the gym to achieve this. Just use a pair of dumb-bells or even heavy books, a yoga mat, and a desire for self-improvement. This exercise regime was developed by fitness trainer Angela Lee, who suggests that you should maintain it for a minimum of thirty days. 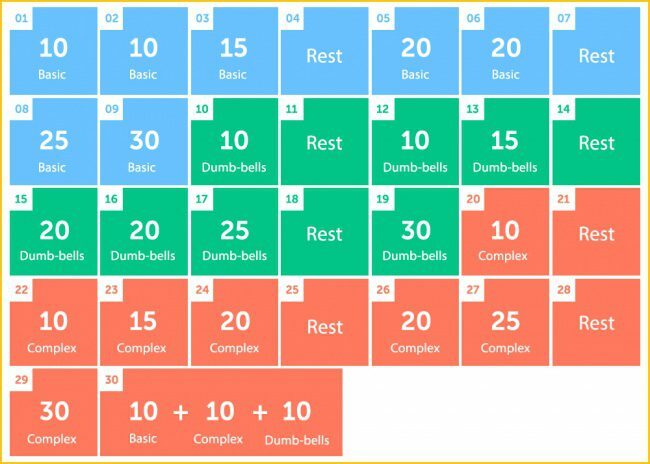 The numbers in each box indicate the number of reps you should do for each day. Do the workout in bursts lasting for 2-3 minutes, with a 1 minute in between. This workout should only take about 11 minutes ever day. With your arms outstretched, do ordinary squats. Place your feet shoulder-width apart, keep your back straight and bend your legs at the knee to form a sitting position low to the ground. The important thing here is to find a good balance and place your body weight on both feet. Stand straight, with your legs placed slightly wider than shoulder-width apart and facing outward. Hold a dumb-bell in both hands and keeping your back and your arms straight, do the quat into the sitting position as in the basic exercise. In the beginning, use light dumb-bells, then gradually replace them with three- or four-kilogram ones. Stand straight, with your legs placed slightly further apart than the width of your shoulders. Keep your back straight and your hands placed on the back of your head (and your fingers laced together), perform the squatting exercise. Make sure you that your feet are pointing out slightly and do not directly line up with your knees. Do not push against your neck with your hands or lean your head forward. You should be able to feel that you are exercising the muscles in your back and not be able to see your elbows in your peripheral vision.